I am trying to crop an image. I create a duplicate layer, then draw a shape over the area I want to select. Drag that shape layer over the copy of the background layer but then what? According to https://designbundles.net/design-school/how-to-cut-and-crop-in-affinity-designer I get to step 8 where I should then be able to move the shaped copy but all I see is a grey shape. What have I done wrong? 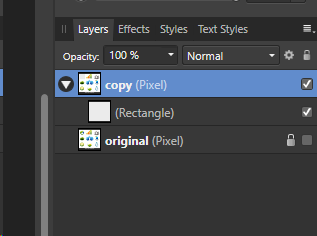 You have to drag the rectangle layer icon onto the thumbnail layer image of your image copy layer, so the rectangle gets a mask for that one. - Or alternatively and maybe easier for you to handle, drag the grey shape rectangle layer to top over your copy layer, and then perform a right click on that layer, select "mask down" from the right click menu. That does the same.